This is a jewelry box made for a co-workers soon to be wife. It is to be delivered tommorow for his going away luncheon, so let me know what you think! 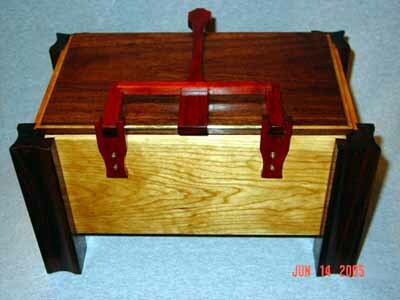 The Box is made of Cherry, Walnut and the hinge is made of Bloodwood methinks... (someone correct me on this one because the wood came in a variety pack from Woodcraft). I'd like to thank Blaine for suggesting making a hinge. When it came time for the hinge I was really stuck, but now I think I will implement different varieties of hand made hinges with the brass bar. One detail that may not have shown up is the "Bloodwood" accents on the lower inside of the legs... used to fill in the remaining dovetail channels. evolves as I build it. 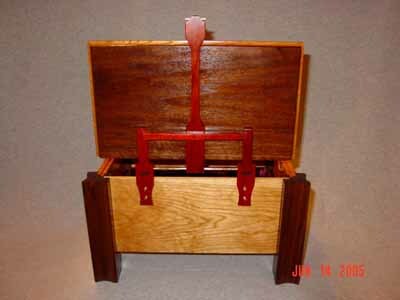 I used sliding dovetails to attach the sides to the legs which have 2 coves cut into adjacent sides. accented with a cove routered edge on the front and sides. 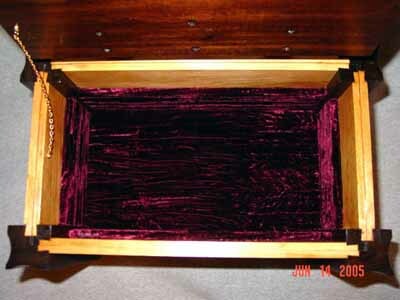 with a rabbet cut in the bottom and top for the bottom and lid. brass rod connecting it all is 1/8" diameter. 1. 100% BLO (Boiled Linseed Oil), applied heavy, allowed to soak a minimum of 1/2 hour then wiped. 2. Next day repeated step one above. 3. Day 3, an even mix of Boiled Linseed Oil (BLO), Mineral Spirits (MS), and Polyurethane (PU) (satin), wiped on and allowed to sit for 1/2 hour and wiped. 5. Finished it off with a thin layer of Johnsons paste wax. 6. The hinge is screwed to the top from the inside. I was going to glue it all together, but I began to think that if a piece of the hinge broke, how could it be removed/repaired/replaced if it was glued? legs are 1.5" squares (2, 0.75" face glued walnut boards). I think all of them are super COOL! I think your box, as a gift, will go over BIG TIME!! I really like your hinge idea... cool method, with bar going all the way across like that. 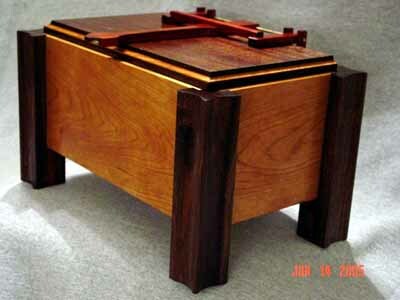 Those sliding dovetails are awesome! 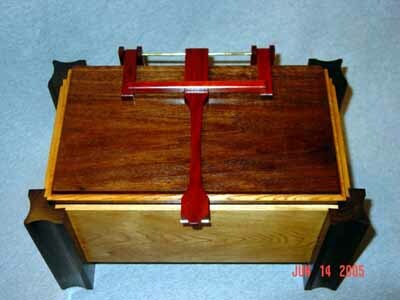 I would like to add your box (with wood hinge) to my Collection... Do I have your permission to do so? We have exchanged PM's and I would be honored to have my work posted on your website. Thank you for asking for permission to do so before just copying the pics. Keep me posted as to the write-up! WOW, I love the hinge. That's a really great idea. Mind if I save off your pictures for future reference? I also love the way you dovetailed the corners. Thank-you for all the compliments... that there is the satisfaction of it all !! This was my own design. It began as a drawing with dimentions and ideas, and as I was building it, it kinda evolved as I went along... especially the hinge. I think it really soilidified the whole box. Sniper: Since you respectfully asked... yes you may, but please try to add your own "design" aspects if you could... I told the buyer that it was "original/one of a kind" and as far as I know or am aware... it is that. Frank: Thanks and well... sorry you don't like the lining, it really is nice looking in person especially when there is a piece of gold jewelry laying inside. Also, this color blended the best with all of the woods used in this project.